Fossil is launching its first truly sporty smartwatch in the shape of the Q Control and perhaps unsurprisingly, it'll be powered by Android Wear. The Q Control sounds a bit like the Misfit Vapor, which falls under the Fossil Group umbrella and features a similarly minimalist 45mm circular case design. It measures in at 14mm thick and has an interchangeable 20mm silicone sport strap to help make it more gym or suit-friendly. Apparently the design was inspired by early 90's athletic apparel, so we think that's Fossil's way of saying it'll go nicely with that vintage Champion jumper. The Vapor-like similarities continue in the features department with the inclusion of a touch bezel that offers an alternative way to navigate the full touchscreen display. It also packs in a heart rate sensor for continuous monitoring including when you're working out. Fossil has told us that it will says it will have connected GPS just like the Vapor, which means it'll piggyback off your smartphone's GPS and will be compatible with apps like Strava and Google Fit. 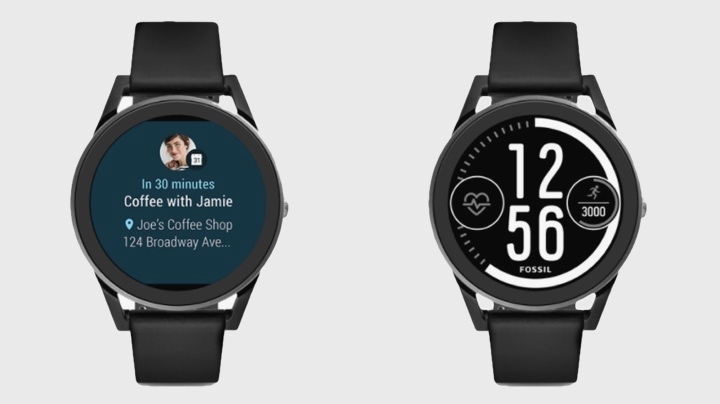 This latest Fossil smartwatch is running on Android Wear 2.0 so it'll work on iOS (iOS 9 and above) and Android phones running OS 4.3 or later. You can expect all the usual features like notification support, activity tracking powered by Google Fit, access to the Google Play Store straight from the watch, Google Assistant support via the built-in microphone and all of the other Wear 2.0 extras. Fossil is including some unique digital watch faces too, but aside from that, you can expect a very familiar OS experience. Powering performance is the latest Qualcomm Snapdragon Wear 2100 processor with a pretty standard 4GB of onboard storage alongside it. The battery will get you through 24 hours of play time before it needs charging again. The Fossil Q Control is priced at $275, which does make it more expensive than the Vapor. It's available from Fossil.com and Fossil stores this week so you've got plenty of time to get it on that Christmas wish list.